Is there any doubt that spring is full upon us? After enduring a slow-moving yet high-energy cold front the last couple of days that brought us five inches of rain, the Florida scrub around my house has exploded with tree frogs. The swallow tail kites have arrived from Mexico. There seem to be more nearby than previous years. Hopefully there will be babies to watch again this year. The turkeys are everywhere. Baby turtles are hiking their tiny-button bodies through the woods looking for ponds. Everything is new new new. Anyone who says that Florida doesn't have seasons has been spending too much time indoors. This morning, I noticed something interesting hanging underneath a silk bay leaf. 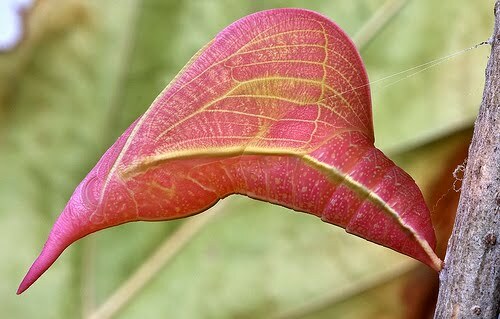 The silk bay, or scrub bay, (Persea humilis) is a familiar tree around here. I say "tree" lightly because like most of the trees in the scrub, it tends to stay very short. I was surprised to find a thinly woven cocoon hanging off the leaf by a single thread. How peculiar that the cocoon looks more like screen mesh than the typical woolly cocoons that moths employ to metamorphosize from larva to adults. Even more peculiar is the cocoon appears to be woven from gold. The delicate strands sparkle and shine in the sun. 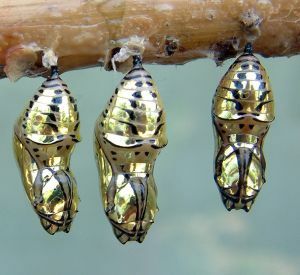 Inside, the tiny pupa can be seen completely loose inside its golden purse. 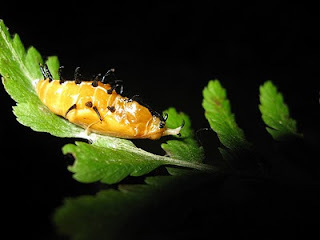 This is the unique cocoon of the Bumelia webworm (Urodus parvula). 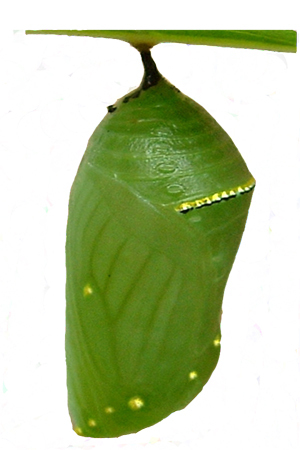 The adult won't win any beauty contests, but its cocoon belongs on the cover of a Chrysalides Photo Book that I wish someone would publish. The chrysalides have been ignored far too long in favor of their flighty adults!